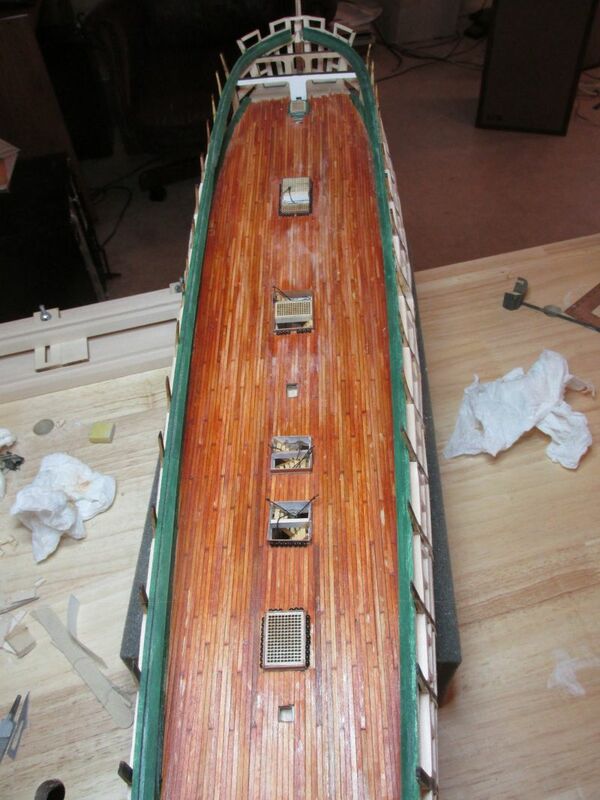 My first attempt, if you remember, was the decking in the captain cabin which I printed on paper and glued to the plywood. Not very realistic but then most viewers won’t even see the that interior. This attempt was made using Minwax Gunstock 231 as the first coat. This has a rosy hue to it. Then, I applied Minwax Golden Pecan 245 to tone down the red and add some depth to the stain. Finally, I added Minwax Polycrylic Clear Satin as the sealer. I got a good simulation of planking, but maybe just a smidge too much red. As it turned out, the color did match to captain cabin. Once more, the viewer will have limited access and dim lighting conditions as well. In any event, it is what it is. The ladder stanchions have not been repaired yet, and I might delay the repair till the last possible moment so that I won’t damage them any further. Another week, another hurricane, OK tropical storm (Michael). I got wind and rain, but luckily no damage. 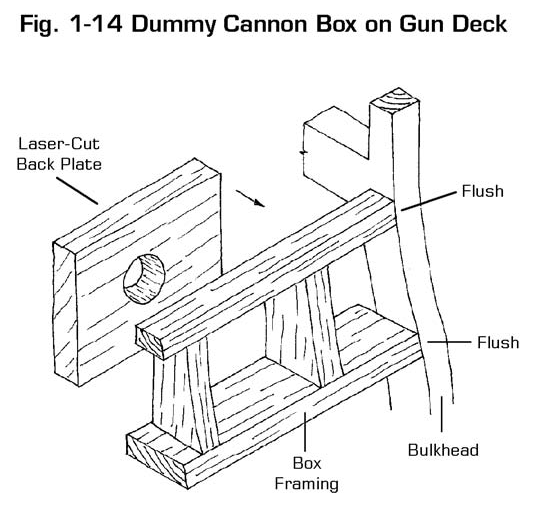 As noted way earlier in my log, I plan to use some dummy guns on the gun deck. 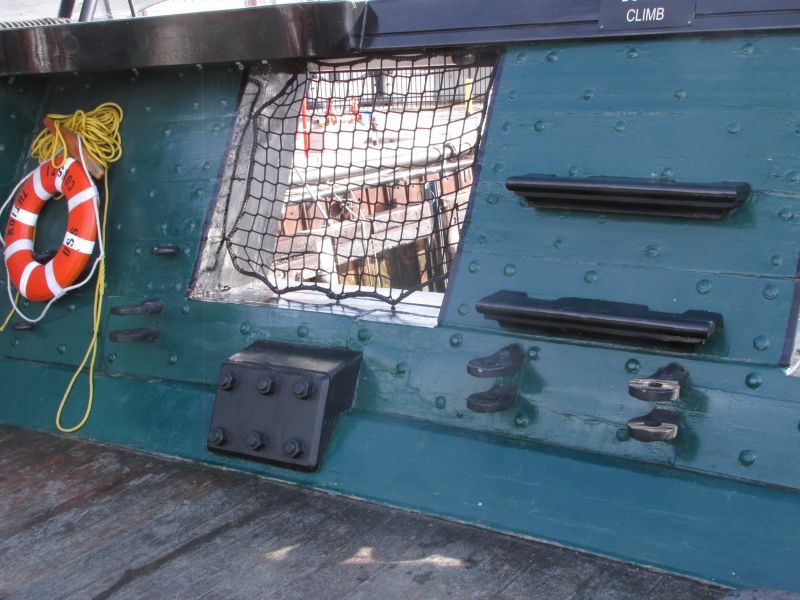 The first pair of gun ports in the bow won’t have any guns at all, as there is no room for them to operate. They may be some confusion when looking at the ship from the outside, because it appears there are guns with a tampion in their barrels poking out through the gun port lids. The tampions are there only to plug the muzzle openings created by the lids. You can see one lying on the green floor beam in the first image. The next set of gun ports aft of the bow and the last two gun ports forward of the quarter galley will have the dummy guns because they won’t be seen (hopefully) through the opens in spar deck. All these ports will have their lids closed so that the gun boxes won’t be visible. The kit instructions show the box piece being added to the framework and states specifically that they should be mounted vertically. 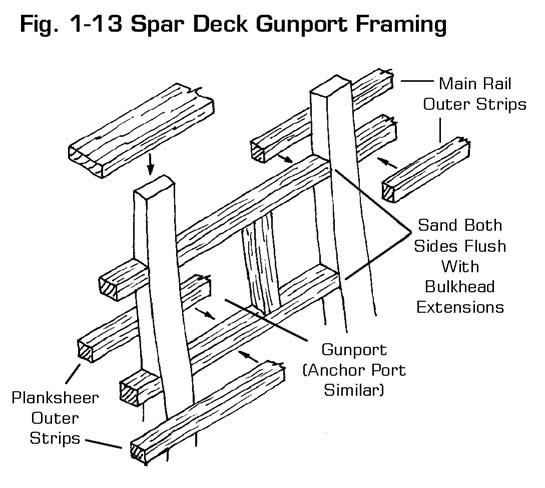 The diagram shows the gun port wall back edges perfectly vertical, however mine are like the spar deck diagram. 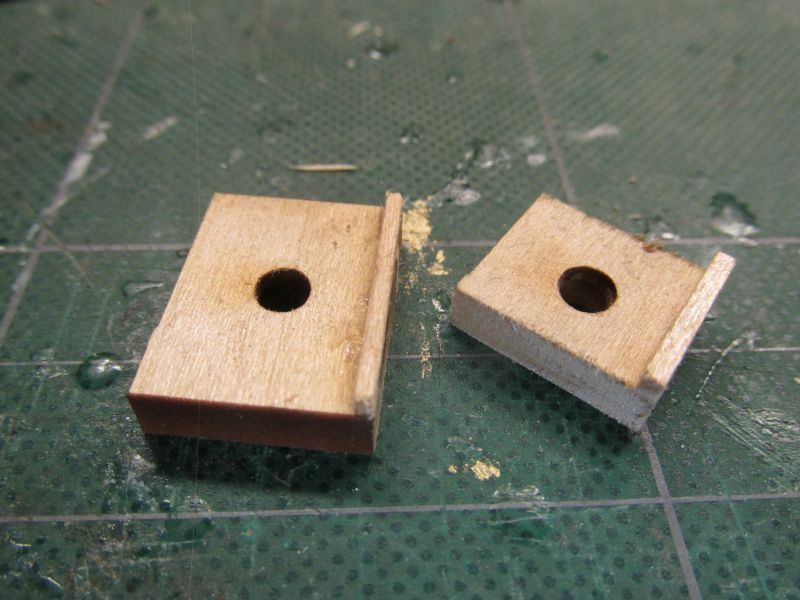 In order to make them vertical, I added a small piece of wood to the base of the box. 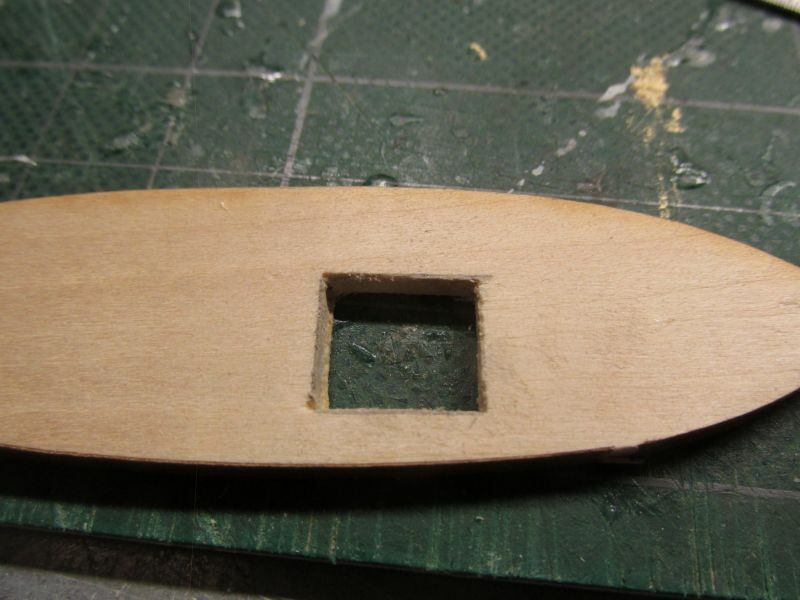 I also had to trim the far aft pair of boxes because they butted up against the captain’s cabin which wasn’t part of the kit’s plans. Those with sharp eyes will notice that I have marked the port openings with black chalk, so I don’t stick the cannons in the wrong openings or plank over them. I have a US Navy plan titled Gun Deck & Inside of Bulwarks by G.F. Campbell with no identifying number or date. Based on the drawing letter style, I would guess it’s from the 1927 restoration. I believe this is when the waist was incorrectly covered over by the bulwarks. 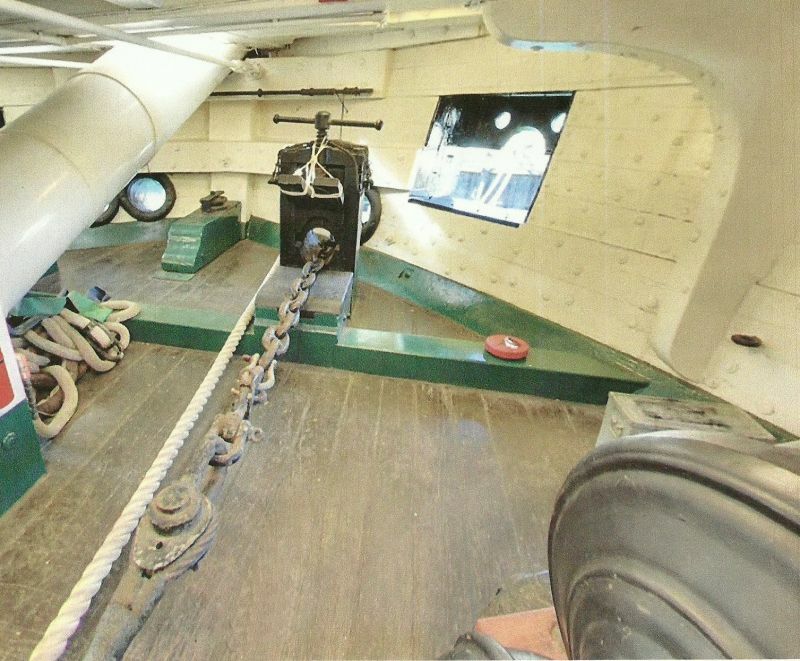 It shows it took 3 bulwark planks to extend from the spar deck gun port sill to its header. 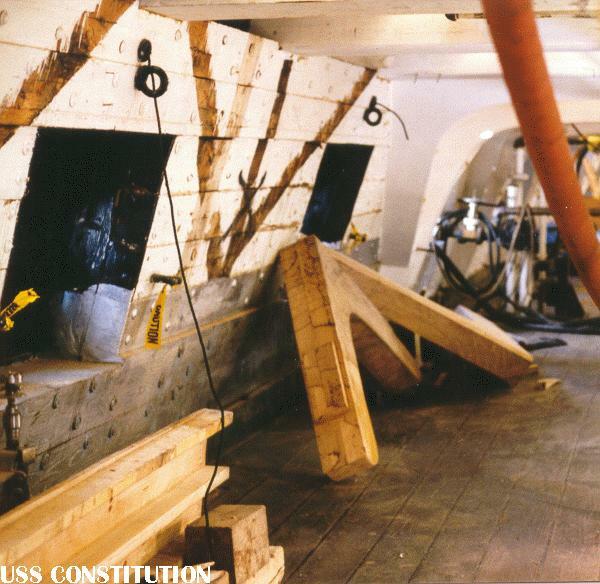 At the same time, it took four planks to do the same on the gun deck. Today, based on photographs, they are both the same at four planks which is also reflected in the kit plans. 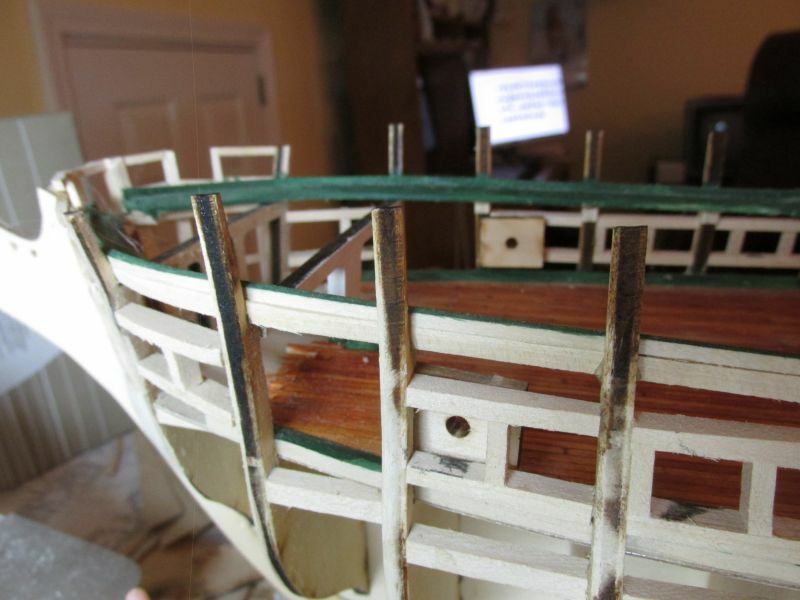 The kit calls for 3/64” thick spar deck bulwark planks. Per direct measurement from the plans (as it does not specify), the planks are 3/32” wide, thus 3/32” wide x 3/64” thick. 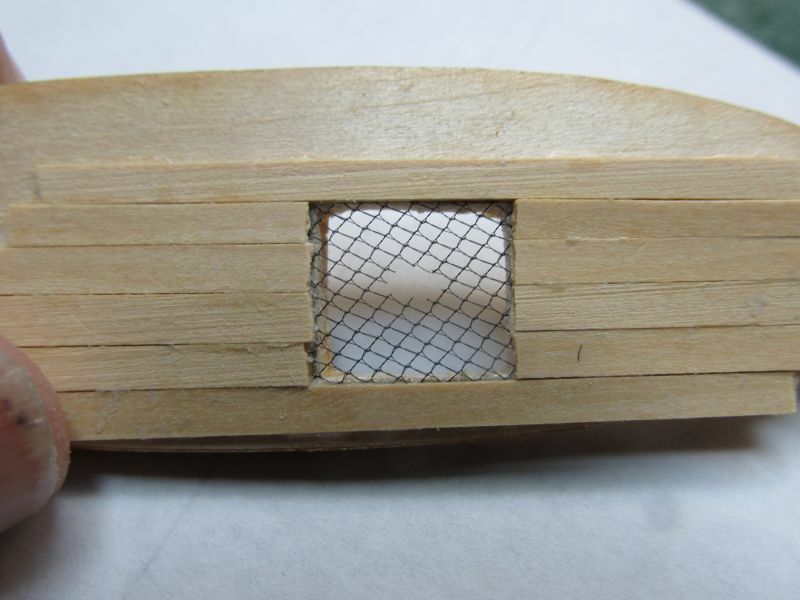 Because the kit does not supply planking for the gun deck, and I’m trying to save a few bucks, I purchased a 1/8” x 4” x 24” piece of basswood instead of buying precut strips. Using my Byrnes saw, I plan to slice the wood into 1/8” x 3/64”. Other build logs I seen have indicated 1/8” x 1/32” and 1/8” x 1/16”, so I’m in the ball park. 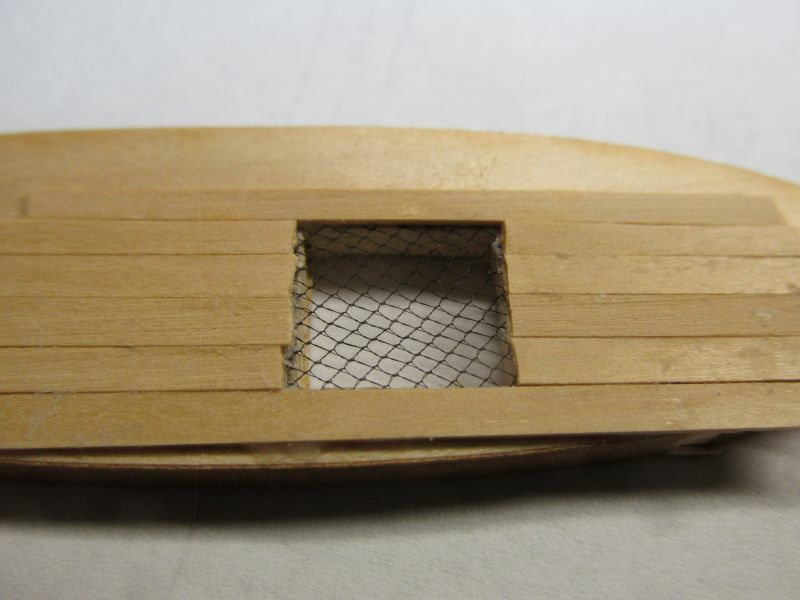 Another thing I’ve noticed is just about nobody has incorporated the netting inside the gun port openings (both decks); I assume for its delicacy and difficulty of fabrication and installation. I may have a simple solution for that. Then I planked it as I would the bulwarks. Because this was a proof of concept, I wasn’t too concerned with the squareness of the edges at the port opening, but this will be a precise operation when done for real because there will no opportunity to square up the edges with a file as the opening will be “closed” with the net. 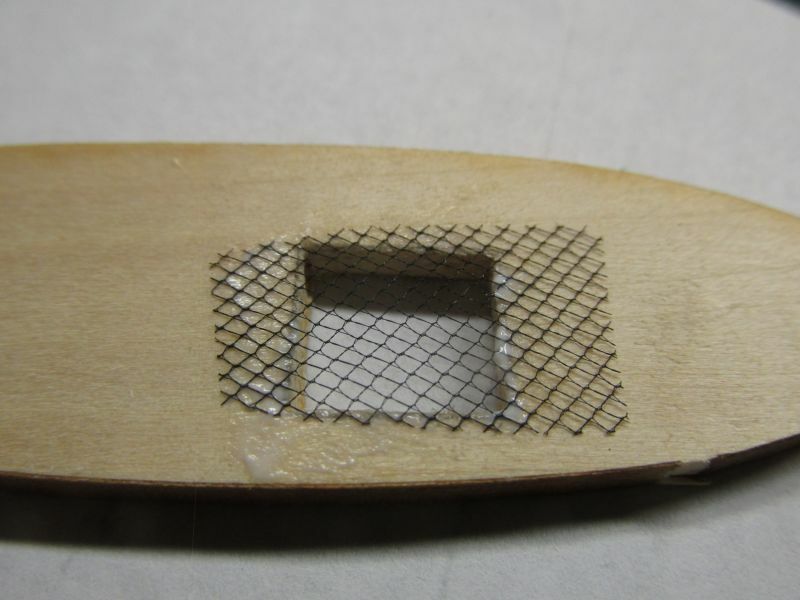 Finally, an opening was made in the net for the gun barrel by cutting the central portion with a fine sewing scissors. I thought about using a hot metal rod to melt a round opening but discarded that idea as too imprecise and very prone to error with one false hand tremor. The outside hull would be planked as you normally would. 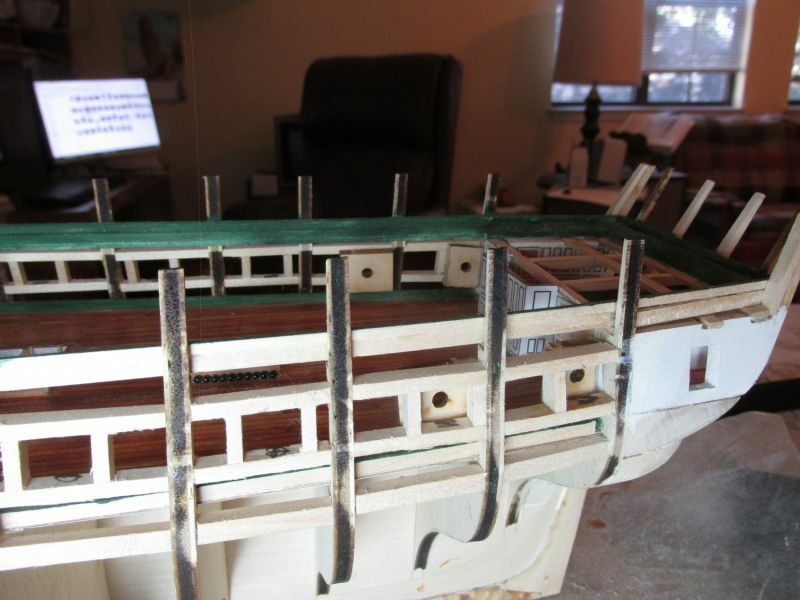 On the actual model, the interior of the port openings would have to be painted black prior to the net being installed. The bulwarks are to be painted white, so care must be taken not to get any white paint where its not intended to be. Isn't that netting a modern 'Health & Safety' addition? It was pointed out to me that the gun port netting may be a modern safety feature like the sprinklers or electrical lighting. If it is, then That would be the reason I've haven't seen it modeled before. 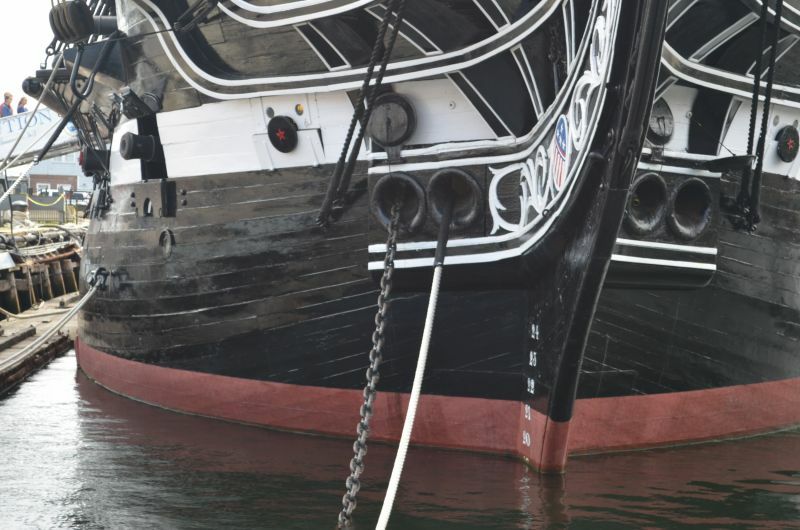 I left an email on the USS Constitution Website and called the USS Constitution Museum Public Historian and left messages asking if the gun port netting was a modern safety feature of actual ship fittings. The first week the silence was deafening with all the crickets chirping. I went through my library of images and the first images I have of the port netting was from the 1960’s. Up until then I couldn’t find an image of them. Finally, I got a call from the museum historian and he confirmed that the gun port netting is a modern addition. The call back took so long was that he was out of town the previous week. So, it looks like I won’t install them after all. Last week I took time off to visit my Mom in Florida. It was also a test run to see how well my back would hold up as I have another trip planned to my Sister’s for Thanksgiving. This time, I’m flying which I believe will be more stressful than my driving trip to Florida. At the end of the month, I have back surgery planned and I don’t know how long I’ll be out of commission. With the gun port netting detail dropped, I can now move on with the gun deck bulwarks. 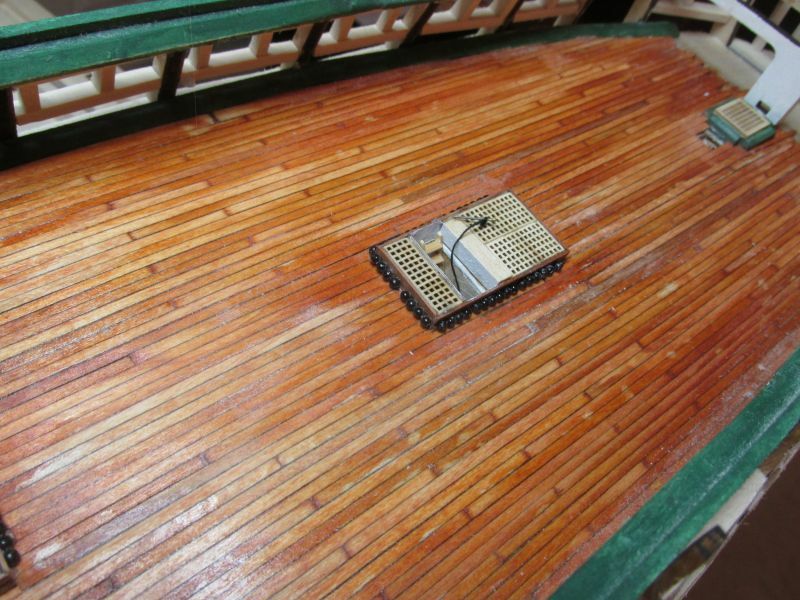 Looking at other builds, I’ve seen some builders make these bulwarks out of full width sheets of basswood or plywood because the surface is to be painted white, making any planking wood seams disappear. I find planking easier than custom fitting large pieces of inflexible wood. 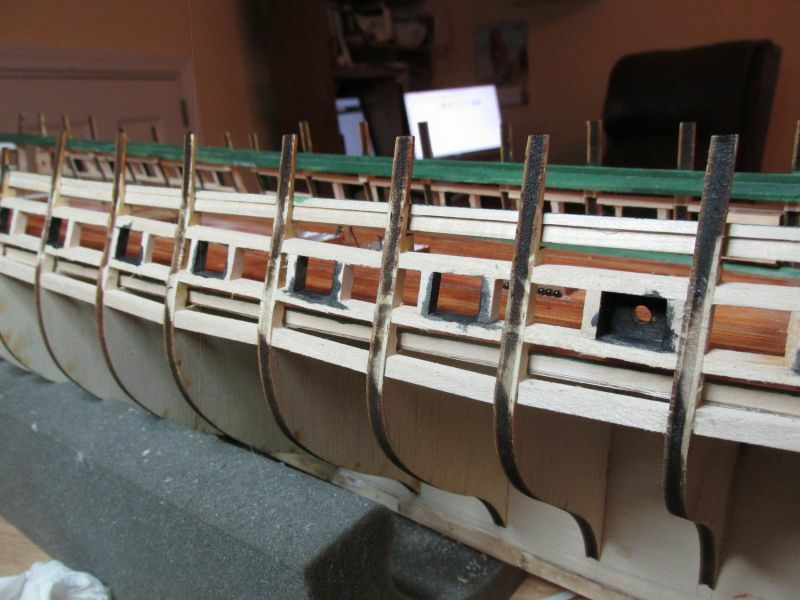 Once again, due to the poor visibility and the painting of the gun deck bulwarks, my choice of plank length will be based on ease of installment and not of historical size. The first thing I did, was paint the inside walls, sills, and headers of the gun port black. The subsequent planking will cover over any black paint spillover.